You had a first date, it was great! Could this be the one? Will there be a 2nd date? …then out of nowhere, you hear nothing! But things were going SO WELL – what happened?! 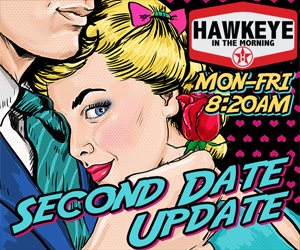 Hawkeye and the morning show can help! Email us to submit your story. Listen for Hawkeye’s 2nd Date Update Monday through Friday at 8:20 a.m. Or listen on demand on the 2nd Date Update Podcast. Click here for podcast episodes. Humans do not need to fill out the last entry (directly above). This is to throw off the robots. So, if you’re a human, please leave the last field blank, or, unchanged. Thank you!